Chucalissa has a long-standing relationship with the Memphis Archaeological and Geological Society (MAGS). In fact, MAGS was founded in the early 1950s based on their interest in research at Chucalissa. The first published field report of Chucalissa was written by Kenneth Beaudoin in 1952 and details MAGS excavations at the site. Today, MAGS members continue to volunteer at Chucalissa on a host of projects. Members of the Memphis Archaeological and Geological Society inventory artifacts at the C.H. Nash Museum at Chucalissa. During one of their volunteer sessions, MAGS members inventoried artifacts from the Fred Jobe collection. We accessioned the collection in 1982 but the artifacts had not seen the light of day since. The 5,000 or so prehistoric artifacts included many whole projectile points, pieces of grounds stone, and ceramic sherds. The collection seemed ideal to form the basis of a museum exhibit. Such an exhibit’s Big Idea could be the prehistoric information obtained from well-documented surface collections – an important point to communicate at any archaeological or history museum visited by avocational archaeologists. The MAGS members performed the initial inventory on the collection, but did not have an interest in pursing the typology or exhibit creation tasks. Instead, they had several other projects at Chucalissa they wished to pursue. 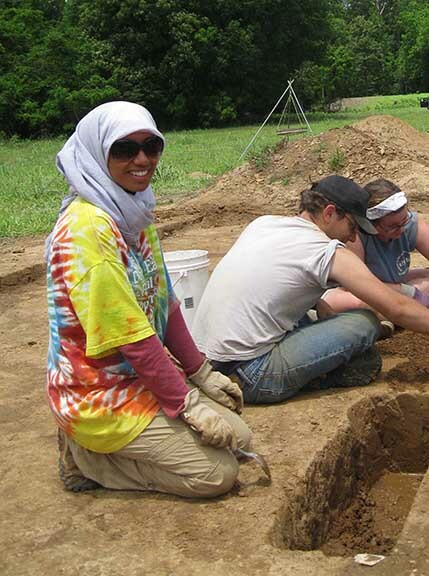 University of Memphis graduate student Nur Abdalla in the field. I teach courses in museum studies at the University of Memphis. I also recruit a dozen or so interns each year for projects at Chucalissa. In the fall of 2013, I suggested that Anthropology undergraduate senior Nur Abdalla take on the analysis of the Fred Jobe collection for an internship. Such a project would draw on her combined interest in both archaeology and museum studies. She agreed. During the internship Nur consulted with Suzanne Hoyal, Site File Curator at the Tennessee Division of Archaeology, to assign a site number to the materials. Nur also identified the lithic raw materials and typed the entire collection. By the end of the 150-hour internship Nur gained tremendous experience in ceramic and stone tool analysis along with processes for documenting archaeological sites. In the Spring of 2014 Nur registered for my Applied Archaeology and Museums class at the University of Memphis. For her class project she proposed to create and install an exhibit on the Fred Jobe collection at the C.H. Nash Museum. We continued to discuss the Big Idea for the exhibit. What was the story the exhibit could tell? The exhibit title evolved to From The Field To The Museum: What We Can Learn From Artifacts Collected In Plowed Fields. 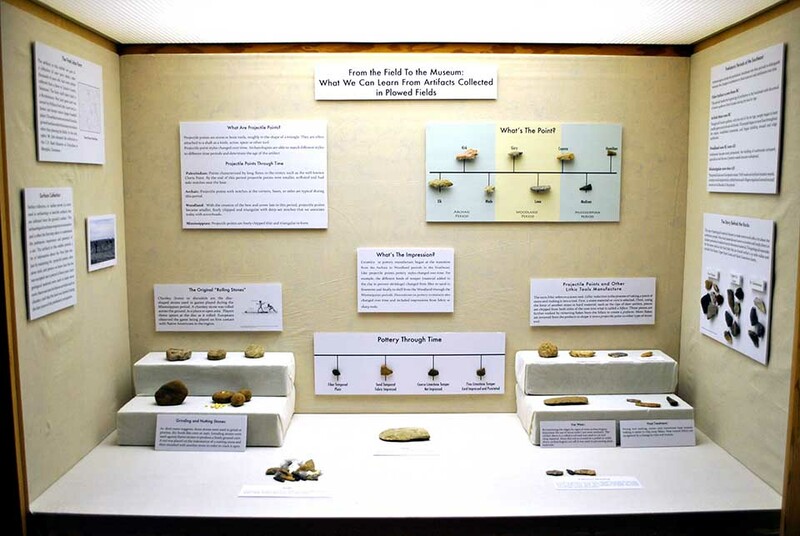 Over the course of the semester we considered the subtopics for the exhibit such as the evidence for trade and exchange, the function of the site, how different stone tools were used, and the time span for the site occupation. By the end of the semester, Nur created and installed the exhibit. I want to emphasize that the exhibit was the result of Nur’s work alone. Through consultation with others and reviewing best practices, she made all of the final decisions on the exhibit creation – a very successful endeavor. We are now in the Fall Semester of 2014. I am teaching the Museum Practices graduate seminar, one of the two core courses in our Museum Studies Graduate Certificate Program. Nur Abdalla is now a graduate student in Anthropology and a student in the Museum Practices class. She is also a graduate assistant at the C.H. Nash Museum. A project for the 15 students enrolled in the class will be to critique the exhibit created by Nur. The students will review “What works and what does not work” in the exhibit and make recommendations on revision. We hope to install the revised exhibit at the Lincoln County Museum in Fayetteville, Tennessee, just down the road from Mr. Jobe’s farm where the collection originated. The story of the Fred Jobe collection is an example of providing increased public accessibility to the collections curated in our repositories throughout Tennessee. Not only does Nur’s exhibit explore an important Big Idea, but both volunteers and students used the collection to further their own interests and develop their skills in archaeological and museum research. As an applied or public archaeologist, this process is important to me on two levels. First, if we wish to argue for the research importance of the collections we curate, we should maximize the use of those collections in research. Second, by engaging the public in the research process and making the findings available to all, we demonstrate the relevance of our work to the public who fund the cultural heritage venues throughout Tennessee. Be certain to visit the C.H. Nash Museum and Nur’s From the Field to the Museum exhibit. Robert Connolly is the Director of the C.H. Nash Museum at Chucalissa and an associate professor in the Departments of Earth Sciences and Anthropology at the University of Memphis. He is also the chairperson of the Public Education Committee of the Society for American Archaeology. He can be reached at rcnnolly@memphis.edu. He blogs at rcnnolly.wordpress.com.